This post is kindly sponsored by Hestan Cue; however, all thoughts and opinions expressed are 100% honest and my own. I can’t wait to share one of my favorite recipes with you today. 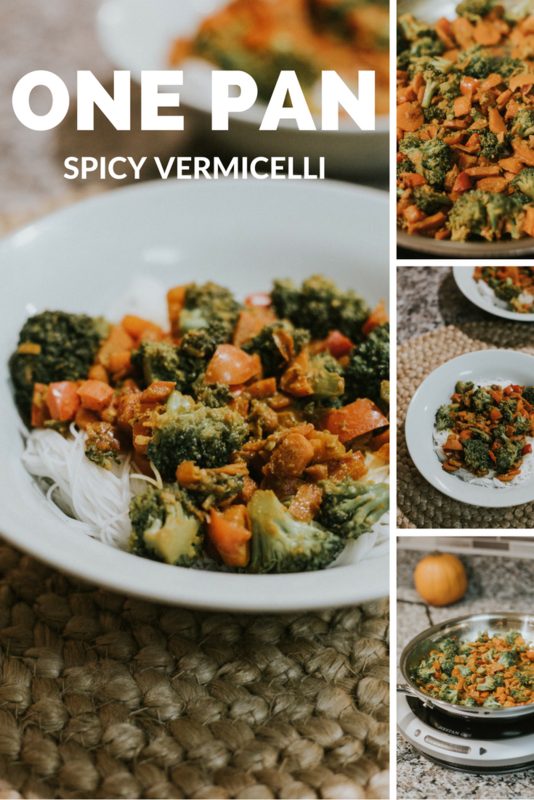 This spicy vermicelli dish is one of our go-to meals, as my husband is a huge fan as well! We love it so much that we made it as our Christmas dinner last year! Yup, we adore the flavor of this savory and spicy dish and I hope you do too. 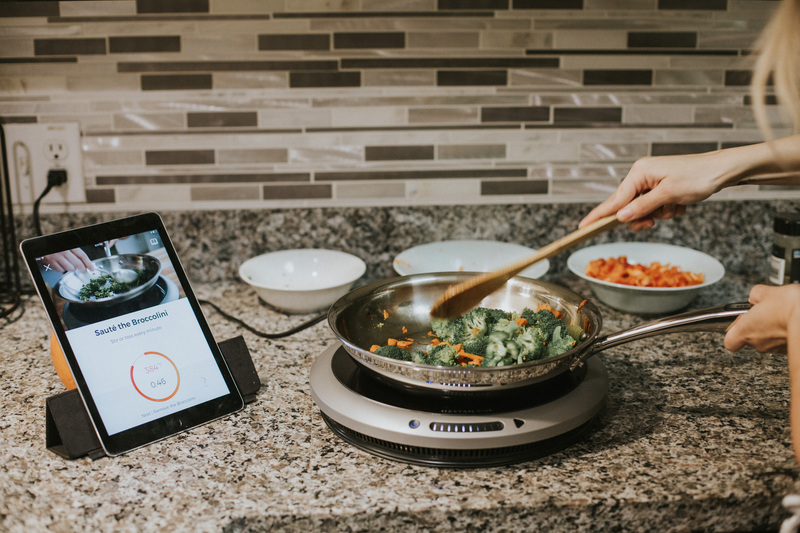 In addition to sharing this dish, however, I’m also sharing a new smart cooking system I got to try out from Hestan Cue. This cooking system makes me feel like a chef in my tiny, little kitchen. I’m wearing my sweatpants, but with the way this pan cooks, I felt like I should have been dressed for a fancy restaurant. Want to learn more about the Hestan Cue product? 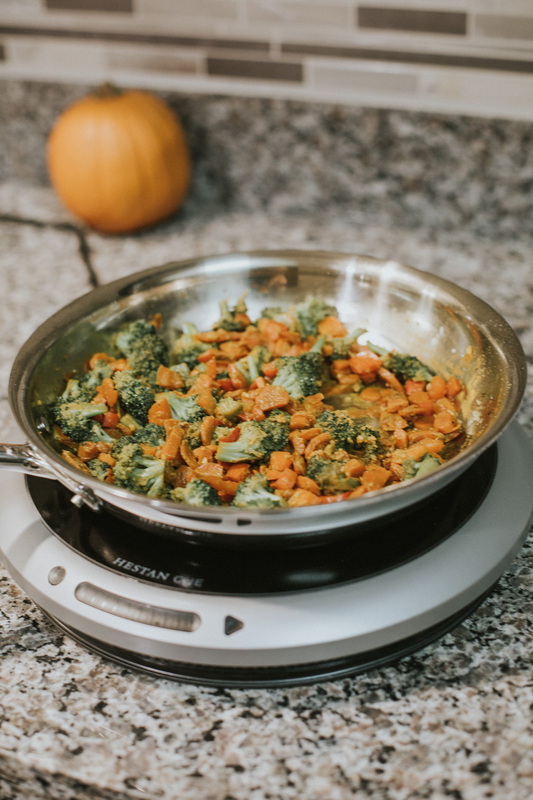 Keep reading to learn about my experience with this cookware! 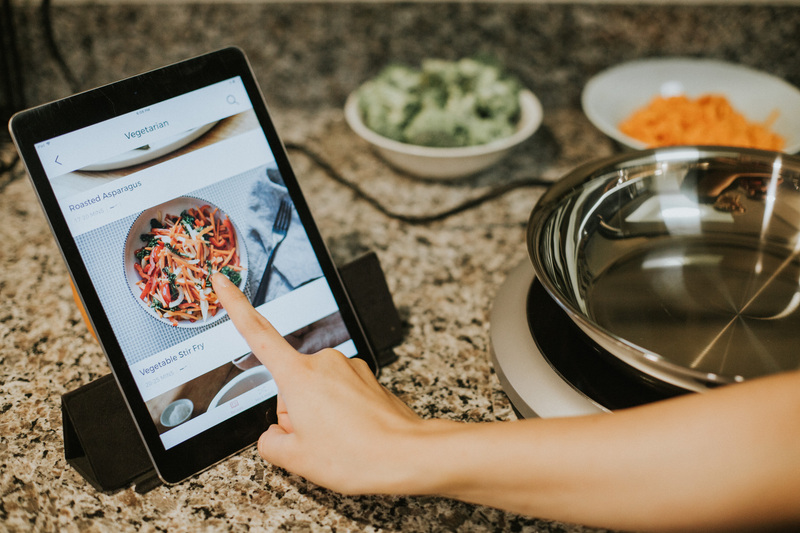 WHAT IS THE HESTAN CUE SMART COOKING SYSTEM? 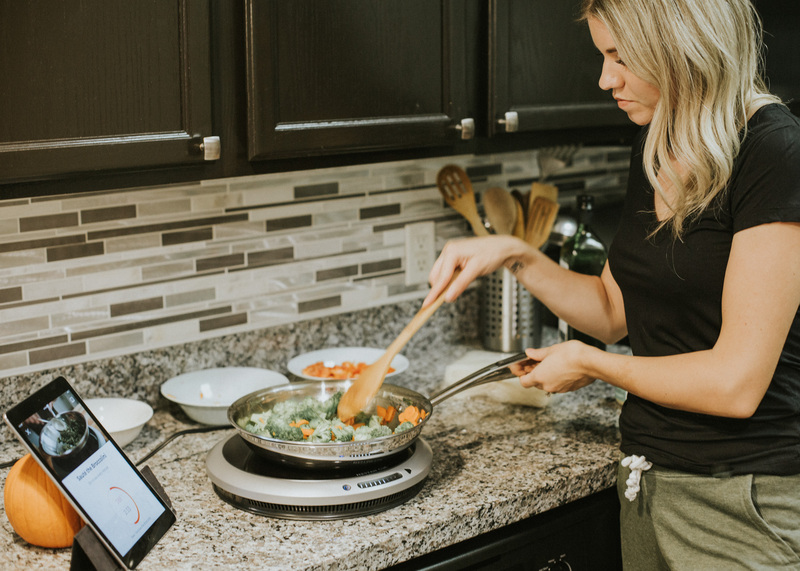 The Hestan Cue smart cooking system consists of a stainless steel pan and and a separate 1600-watt induction burner with a glass-ceramic cooktop. Basically you can cook without having to turn on your stove! 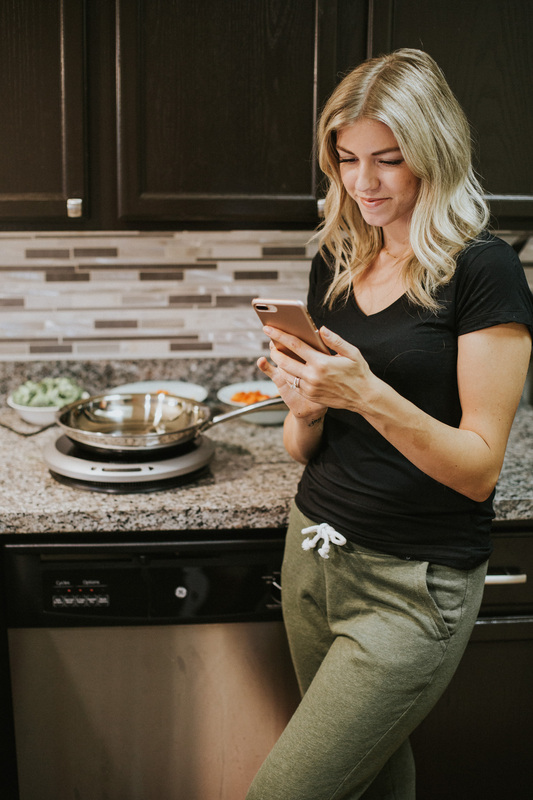 The Hestan Cue system uses Bluetooth® technology to connect to the Hestan Cue app on your phone. 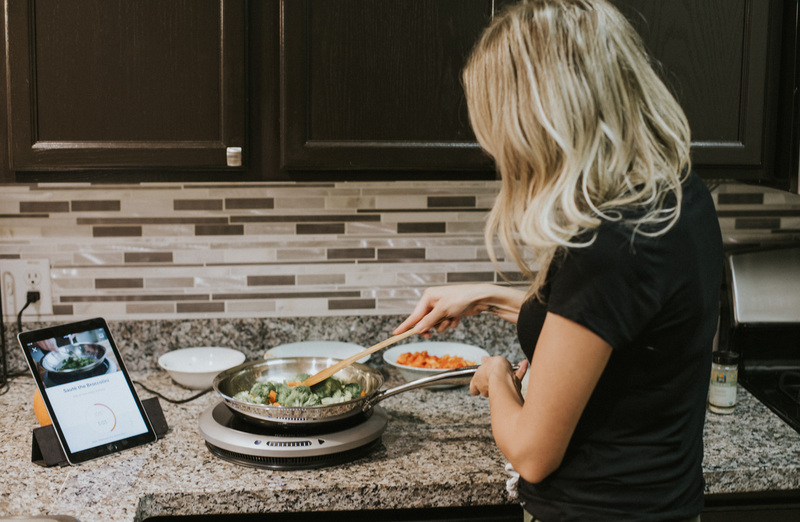 Together they provide a seamless cooking experience right in your own kitchen. 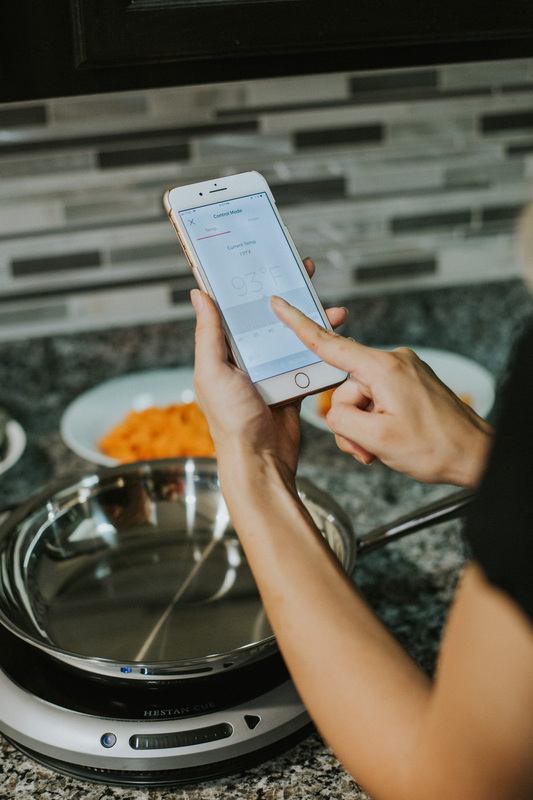 The app features several recipes based on lifestyle, diet, and type of food you’re wanting, like breakfast, lunch, or dinner. 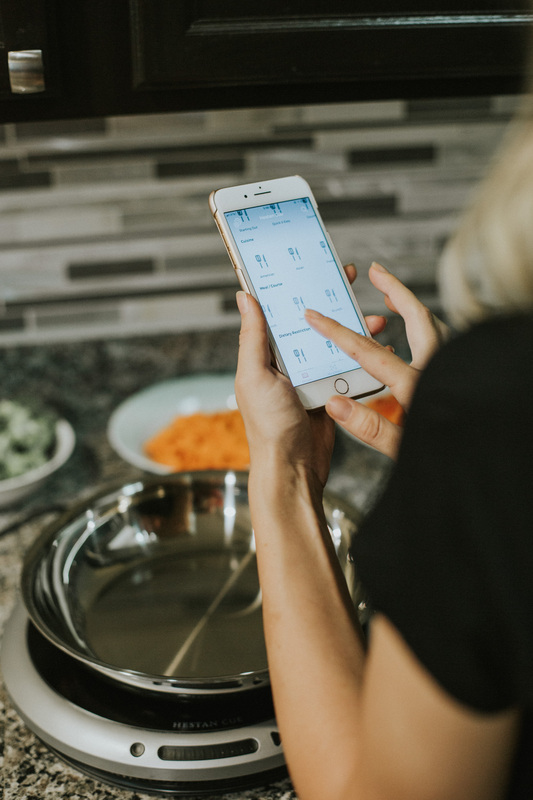 Once you select a recipe and gather your ingredients, you can power up your app and it will take you through the prep stages. Then, as you push “Next” in the app, it will eventually take you to a spot where your pan preheats itself. That’s right. 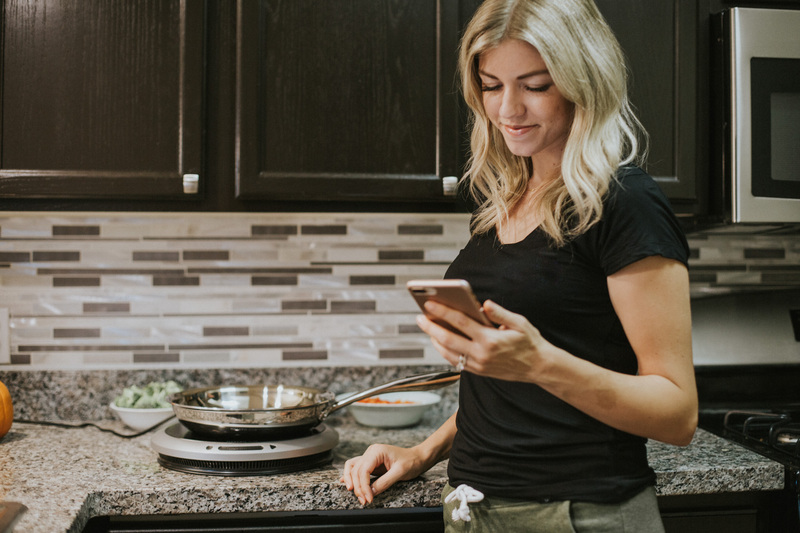 Once you pair your phone and the burner, they do all the temperature adjustments for you while you cook based on the foods you’re preparing. No more burning food, am I right? So as you can see below, I’m using the Hestan Cue to make a veggie dish. The first step was to sauté the veggies. The app alerted me when it was time to add the food, and it timed the specific ingredients’ cooking time as I added them. I also loved the videos that accompanied the steps since I am such a visual learner. I just followed each direction and eventually the dish was ready to serve. 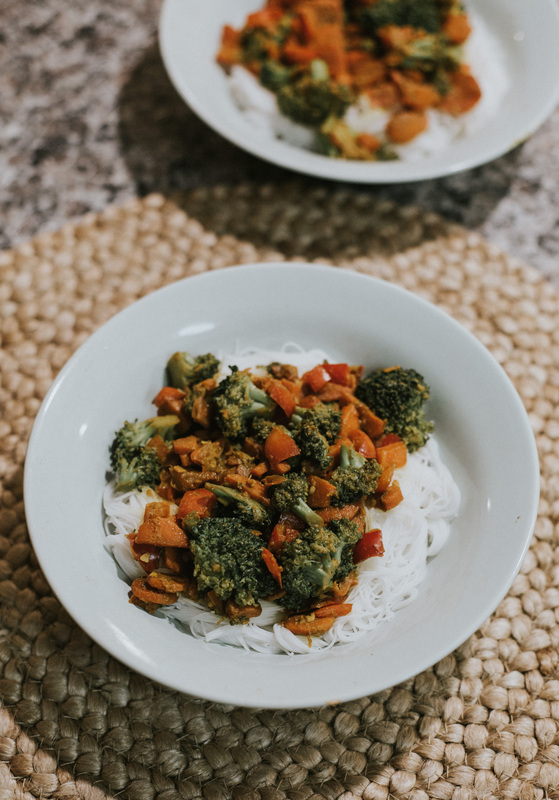 I must say, I’ve made this spicy vermicelli dish many times and using the Hestan Cue literally cut my cooking time in half. 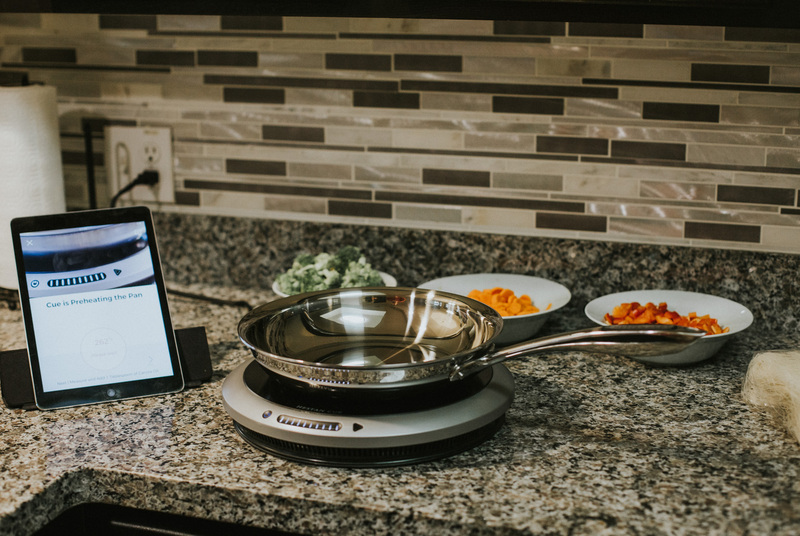 The Hestan Cue Smart Cooking system is also great for boosting confidence in the kitchen. I’ve never thought of myself as a wonderful cook, but it’s like going to a culinary class but I get to wear sweatpants! Ha! 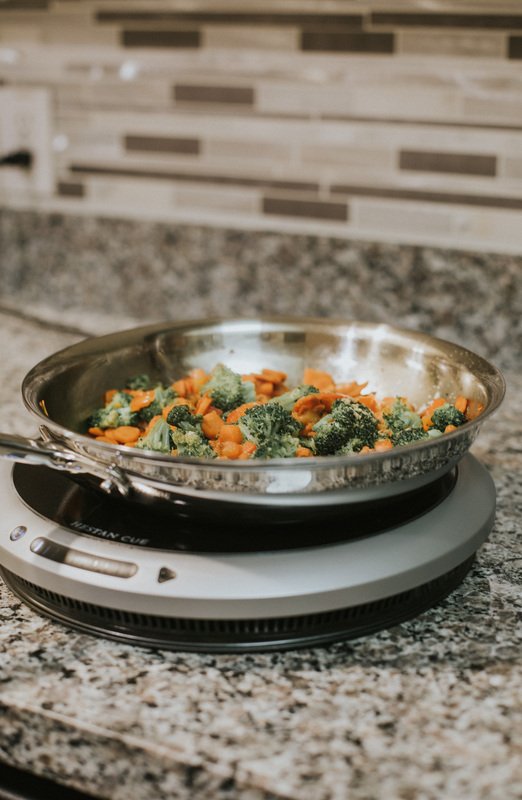 Plus, for those of us who have older houses, hot summers, and have an old gas oven and stove that heats up the whole house when you cook, this cooking system is a lifesaver. Have a favorite recipe you love but want to make it using your Hestan Cue cooking system? No problem! The pan is so easy to use in control mode. 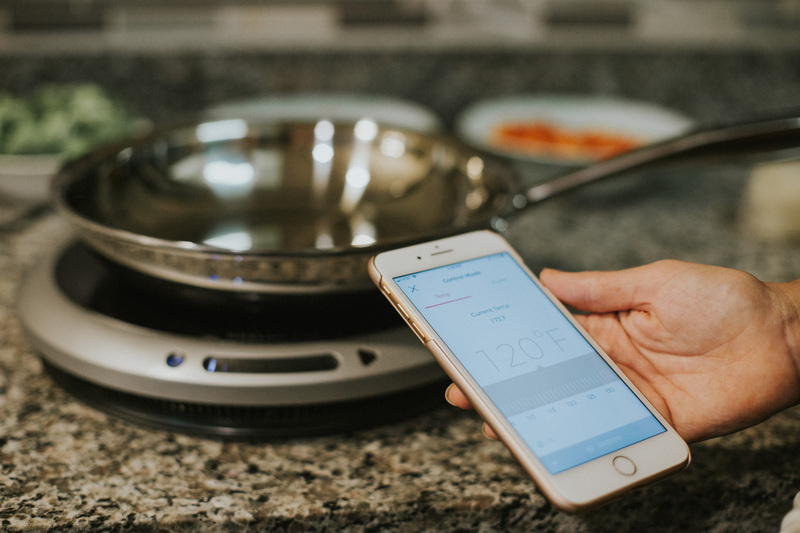 Instead of following the step-by-step directions on the app with one of the Hestan Cue recipes, you select “control mode” in the app and you can set the pan to whatever temperature you need depending on the food you cook. I started out with this dish in the app since the recipe I made was similar to one Hestan Cue offers, but ended the cooking session with control mode. It was a seamless experience even using both features. I do, however, love how fool-proof the app recipes are. I’m going to be trying those out a bunch in the future. Like I said, we made this dish for Christmas dinner last year, so it’s THAT good. The serving size for the measurements below are for two people (and a toddler), but it’s easy to double or quadruple for a large group too. This asian-inspired dish is salty, savory, sweet (from the ginger), and it has just the right about of spice. Using the Hestan Cue app in Control Mode select 300° F to cook the veggies and let the pan preheat. 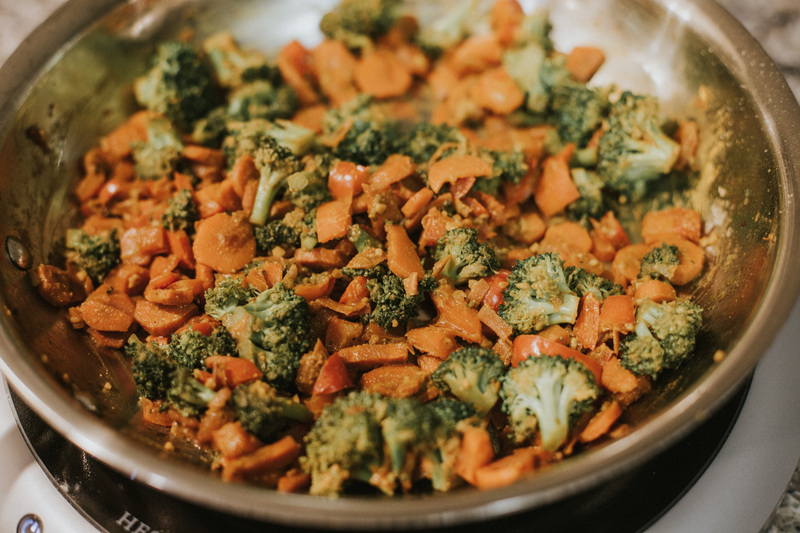 Add some avocado oil (about a tablespoon) and sauté the carrots for about 5 minutes or until tender. Add a bit of pepper. Then add in the broccoli florets and cook at the same temperature for another 5 minutes. Add the red bell pepper and let everything finish cooking for another 5 minutes. You can turn down the heat to 100° F, then add in the curry powder, garlic powder, turmeric, and ground ginger. Then add the 2 tablespoons of soy sauce. Let the flavors simmer together for a few minutes, then it’s ready to serve! 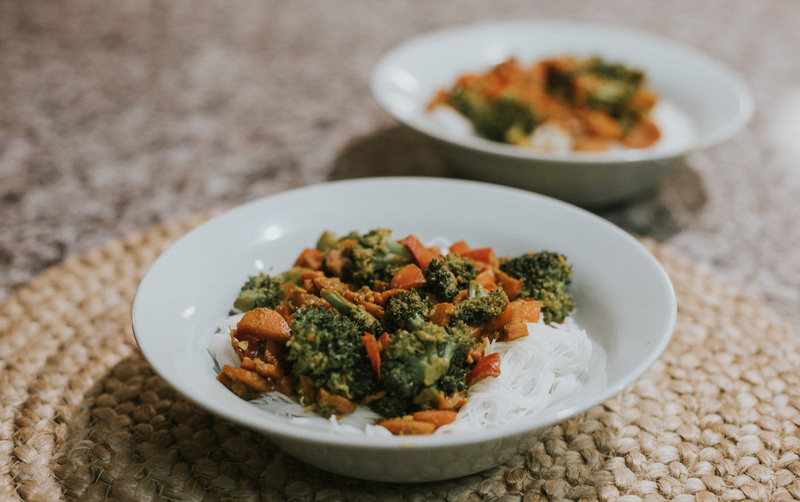 Serve over a bed of steamed sprouted rice or cooked thin rice noodles. Heat one tablespoon of oil in a sauté pan. Sauté the carrots for 7-9 minutes or until tender. Then add in the broccoli florets and cook at the same temperature for another 7 minutes. Add the red bell pepper and let everything finish cooking for another 5 minutes and make sure every veggie is tender. Then add in the curry powder, garlic powder, turmeric, and ground ginger and mix well. Then add the 2 tablespoons of soy sauce. Let the flavors simmer together for a few minutes, then it’s ready to serve! 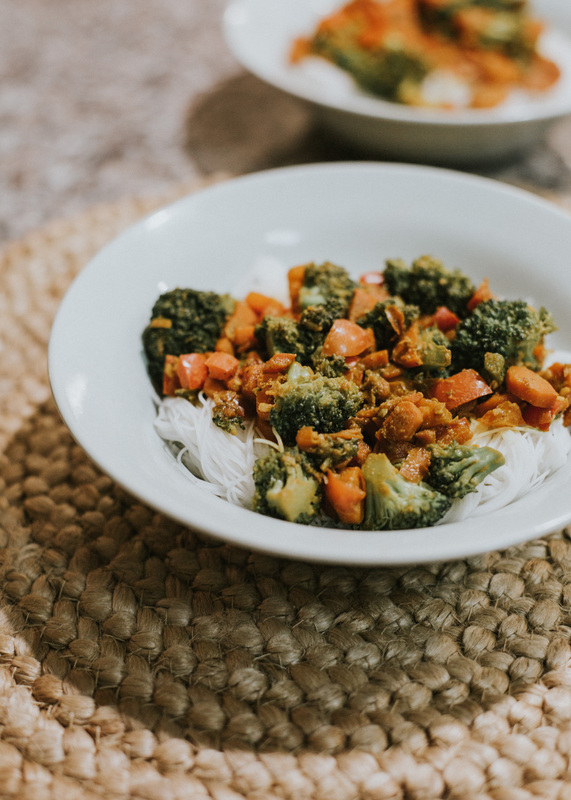 This truly is one of the easiest things I’ve ever made, and you can’t beat healthy AND flavorful food! I’d love for you to try this out, and if you do, use the hashtag #LivinginColorEats so I can see your beautiful food photography + see your review! If you enjoyed reading this post, please consider pinning one of the images below so that other people can find this recipe and enjoy it too! My goodness, that looks wonderful! What a great post! You were a lifesavor tonight. I couldn’t think of what to make for dinner and I had every single item on the recipe, even the rice noodles. I was meant to make this. Eating it now and so yummy. I did add chicken stock to noodles. Love the spicy too. Thanks.